Recently we have started using the Math-U-See curriculum in our home, adapting it for our pre-primer children. One of the highlights of the program is making a poster of a placed called "decimal street" to teach place value. Looking for ideas, I found The Daniel Academy's lapbook. I really liked the idea of using Cars characters to make the street more appealing. For our edition, green units go to Mater's tow yard (mater is green! 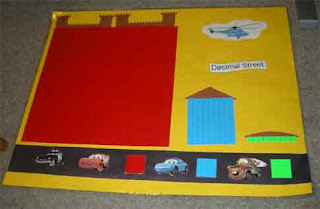 ), tens go to Sally's hotel, and the hundreds get to go to Lightning McQueen's castle. Sweet! The Sheriff is there to make sure that none of these places become too crowded. Only nine units can be in Mater's tow yard at one time, for example. If there are ten, then they trade up to become a ten block and can go to Sally's hotel. The helicopter is there because he's just cool that way. Un-pictured are the numeral cards that can be placed on the respective squares to say how many blocks there are (or should be) in the different places. 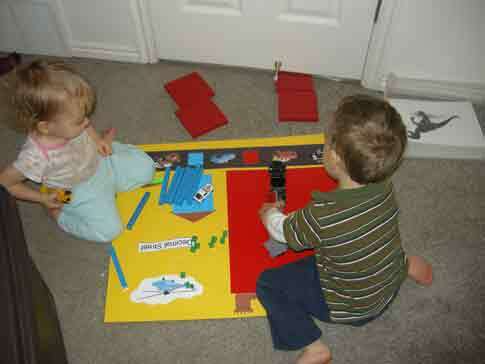 My children (namely my son) love to use their trucks to load the different blocks. If a tornado stirs things up, it's the truck that puts every block back in it's place. "Mommy! The semi-truck is taking the tens to Sally's hotel!" Getting to play with the math-u-see blocks is their reward for finishing the rest of their school. I have been amazed at how my son has picked up on the idea of place value with this poster, because he still doesn't understand his numbers yet beyond four. Four-hundred and forty-four makes perfect sense to him, but five is still a little hard for him to grasp beyond knowing that that's how many fingers he has on his hand. Playing with the blocks every day is helping him learn his numbers too. Brilliant blog post, lots of helpful knowledge. Mommy, what happens to fish in the winter?